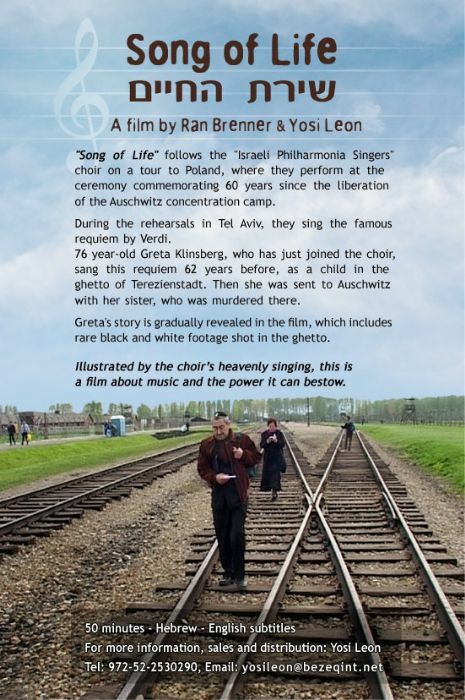 The documentary Song of Life follows the one hundred singers of the "Israeli Philharmonic Singers Choir " on their tour to Poland, performing at the Ceremony commemorating 60 years since the liberation of the Auschwitz concentration camp. At the rehearsals in Tel-Aviv the choir sings Verdi's famous Requiem. The singers are not aware that the 76 years old lady, Greta Klinsberg, who has just recently joined the choir, sang this requiem 62 years earlier when she was a child in Terezenstadt, before being sent to the Auschwitz with her sister who was murdered there. Her story is revealed to the choir and the audience step by step as the film progresses. Greta was among the few who survived and since then she has never stopped singing. In the course of the film we learn about some of the individual singers of the choir, and their personal connections to the Holocaust. The documentary features songs sung by the choir and also shows some rare black & white footage of the last Opera sung by Greta as a child. This footage was taken by the Nazis in Terezenstadt before the children were sent to Auschwitz. In general the film is about music and the power it gives to people.